Roland Rubix audio interface series: Rubix22, Rubix24, and Rubix44 (top to bottom). With their high-fidelity sound, compact size, and affordable prices, Roland’s Rubix audio interfaces are a perfect fit for today’s on-the-go musicians and producers. Three different models provide audio I/O configurations to suit a variety of needs, and all support high-resolution recording at rates up to 24-bit/192 kHz. MIDI I/O is also included, and near-universal USB support provides seamless integration with Mac and Windows computers. Rubix interfaces can also be used with Apple iPads, allowing you to create a pro music production and performance rig with amazing sound and unmatched portability. Roland’s renowned SuperNATURAL® technology powers the V-Combo VR-09’s classic tone wheel organs, while nine harmonic bars provide authentic, instantaneous performance control. Jordan Rudess is best known as the keyboardist for the progressive metal band Dream Theater. He is also a composer and the President and founder of Wizdom Music. In this video, Jordan shows how to use the Roland Lucina AX-09 keytar to control his iPad based SampleWiz app using the AX-09’s various controllers. 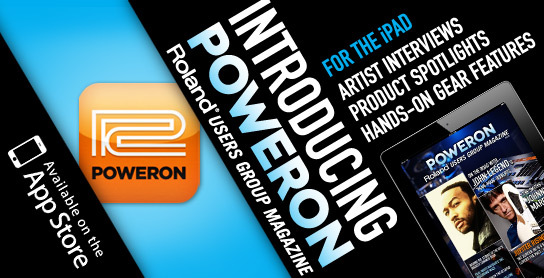 We’re excited to announce the launch of PowerOn Roland Users Group Magazine, our new digital magazine for the iPad. Available from Apple’s App Store, this fun, interactive tablet-zine features the latest Roland news, artist interviews, gear how-tos, product spotlights, and more. Best of all, it’s free—subscribe and download the premiere issue right now!